Whenever I visit California my brother Patrick sets up a big ride or two for us to do. In the winter we face limited choices due to snow bound mountain passes and less daylight. 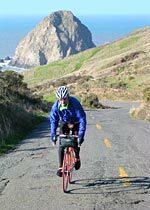 We usually content ourselves with local rides in the SF Bay Area, yet in recent years Pat has put forward a more ambitious ride: The Tour of the Unknown Coast. Officially run in May, it appeals to Pat because it offers a century on isolated roads, plenty of climbing, gorgeous scenery and theoretically you can ride it any time of the year. However, for us it also represents four hours of driving each way and in the winter there's not enough daylight for a 100 mile ride on gnarly roads. We scheduled this ride a couple of times in years past but had to cancel due to adverse weather forecasts—it can rain a lot up in that part of California. Patrick, always up for a challenge, has wanted to ride The Tour of the Unknown Coast on the Winter Solstice—the shortest day of the year. It would involve starting before dawn, riding with headlamps to light our way—no big problem, Patrick assured me. He'd done The Tour of the Unknown Coast like that once before. The evening of December 21, 2004, we drove up to Humbolt County, pulled over and slept in the back of Pat's truck. The alarm went off at 5:15 AM, Thursday, December 22 (the day after the Winter Solstice—close enough). At 6:15 AM we shoved off to do this delightful, though challenging, ride.